New York may have a consolation prize in the LeBron James sweepstakes -- Cliff Lee, CBSSports.com reports. 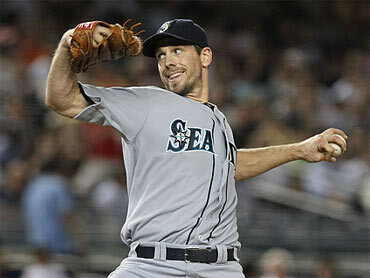 The New York Post 's Joel Sherman reports the Yankees are "on the brink" of getting Cliff Lee from the Mariners. Sherman doesn't attribute the report to any source other than his own report, but says New York will give up top prospect, catcher Jesus Montero. Sherman's report does hedge its bets, saying "The Yanks were not assured of obtaining Lee since other clubs such as the Mets, Twins and Rangers were in talks." Lee is scheduled to start against the Yankees tonight. According to the article, Seattle's Jack Zduriencik suddenly wants to work quickly, trading Lee before the All-Star break. UPDATE: ESPN's Buster Onley reports the Yankees and Mariners have "no agreement in place" for Lee and that it's possible another team could still get a deal done for the Mariners' ace. 1. Is Cliff Lee really going to the Yankees, or is this more New York hyperbole? 2. Is Zduriencik using scare tactics to get other teams to up the ante? Once you mention the Y word in baseball, emotions can get involved. 3. What would the Yankees do? They'd have six starters in the rotation, and theycould be looking to trae one of them, even if they don't get much in return. 4. Are the Yankees just making sure they win a title, not just by improving their team, but keeping Lee away from any potential competition? UPDATE 2: The New York Times' Tyler Kepner reports the offer from the Yankees has been made and it's up to the Mariners to decide. Then the question becomes do the Yankees and Mariners get this done tonight, before Lee is scheduled to pitch against the Yankees? If so, when does he make his debut for Yankees? It would likely come in this series, so the Yankees would be dodging a potential loss and the Mariners would get to see all too well what they gave up.